Here it is, folks. 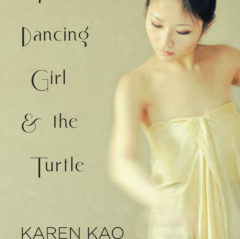 All the news on the launch of my debut novel: The Dancing Girl and the Turtle. I’m headed to California in April on a DIY book tour. Most of the events are private (thank you Rozanne, Jim and Steve!) but here is one that is open to the public. Saturday, April 22 from 1-2:30pm, the Chinese Historical Society of America will host me for a Meet the Author talk. The CHSA is "the oldest organization in the country dedicated to the interpretation, promotion, and preservation of the social, cultural and political history and contributions of the Chinese in America." Tickets available here. I’ll be posting these reviews as fast as they come in. I can’t tell you how very pleased I am with the current crop. From the Contemporary Small Press in London, a wonderful review of my novel. 07.04.2017. Becky Danks captures my novel is all its complexity: the opulent time period, the seedier side of Shanghai and the oppressive courtesan culture that fed it. The pain and the violence are described as well, so I’m particularly happy about this observation. The human need for intimacy and understanding is apparent on every page. Gripping and complex, this challenging read provides an intensely detailed, often harrowing but ultimately sympathetic insight into a lost culture. Kao writes in a minimalist present tense, each word meticulously chosen and exquisitely placed in the manner of a poet. The real power of this novel lies in the gradual unveiling of the brutal realities. Karen Kao is a master of the Noir. That’s 1 April 2017 (yes, April Fool’s Day! ), the publication date of my book. The launch party for my novel will be on Saturday, April 8. The host of this event is Boekhandel van Rossum. You’ll hear readings from my novel, see photos of Shanghai and listen to 1930’s jazz music. Very good. You can do that here, too. My book is NOW AVAILABLE for purchase via my publisher, Linen Press. They will ship books worldwide. You can also order my book through your local independent bookseller, rather than feed the monopolist. Dutch readers can go to Boekhandel van Rossum to pick up a hard copy for as long as supplies last. You can of course also buy from Amazon or bol.com.